by MERKS: Day 246, outfit 246. 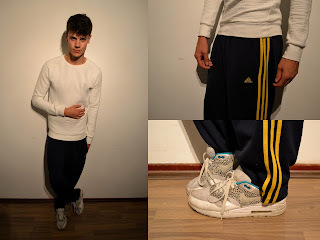 Today, I'm wearing a vintage Adidas sweatpants. Bought it in Amsterdam and great fitting. Combined with a white Zara sweater and my white Nike Air Max 1 Safari. I WAS ALL DAY LONG DANCING AND GIVING CLASSES. I THINK I'VE DIED.